Google is known around the world for its online services, most notably the company’s hugely popular search engine. Google has become the definition of searching for information on the internet. Google’s other enterprises include advertising technologies designed to help e-commerce merchants perform better online, both organically and through paid ads. Google Merchant Center is one of Google’s advertising technologies designed to help display your product listings in Google Shopping and Google Product Ads. Therefore, if someone searches for a product on Google and sees product offerings, these product ads were created using Google Merchant Center. Shopping campaigns created from your Google Merchant Center account put your product images, price, and business name right in front of people searching on Google, no matter what device they’re using. You only pay when people click through to visit your website or view your product availability / inventory. Creating an account through the Google Merchant Center can have several advantages for online merchants. The benefits mostly from the fact that Google is the most commonly used search engine in the world with over 70 percent of all online searches. Retailers with a Google Merchant Center account can boost their product exposure to consumers and significantly increase sales. The tools within Google Merchant Center allow merchants to upload their product listings for Google Shopping Campaigns. The tools have been highly rated by business users including high marks for features, ease of use and help/support. The Google Merchant Center lets a user upload their product inventory, including rich data about their products, such as tags, product description and price. These results can be displayed both in the regular Google search results and the dedicated shopping results. Setting up a Google merchant accounts lets the merchant make the most of the power of the global search engine. Your product inventory data can be used for many purposes including sponsored search results, shopping results and PPC advertising. How Much Does a Google Merchant Center Account Cost? Creating a Google Merchant Center account is “free”. Retailers simply create a Google account, and then sign into the Google Merchant Center to complete, configure, and verify their account setup. 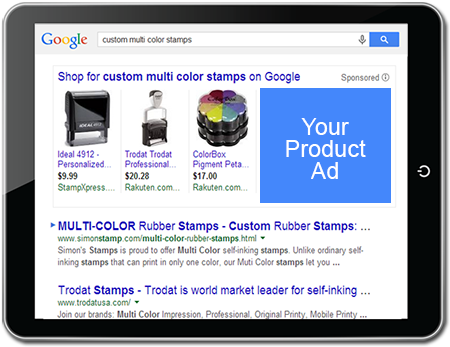 Next, you establish a Shopping advertising campaign in Google Adwords. You set the amount you wish to pay when a shopper clicks on your product / product listing advertisement. Google Adwords provides recommended amounts for PPC (pay-per-click). For most retailers, advertising costs with a Google Shopping campaign cost on average about $11.00 for every $100.00 in sales. Compared to other marketing channels, Google Shopping costs are extremely low, much lower than the flat fees charged by Amazon in their marketplace categories. However, PrestoSell can optimize your Google Shopping campaign to reduce these costs by as much as 50% (as low as $5.00 for every $100 in sales). Merchants looking to expand their online retail business online will benefit from setting up a Google Merchant Center account. Google Merchant Center is an easy tool to set-up and the staff at Google provide extensive help. Establishing a merchant center account on Google provides a way to show all relevant product information on Google and increase the exposure of your products. If you’d like to know more about how to set up your Google Merchant Account, and what costs are involved, please contact us for more information. We are here to help! → How Much Does Google Shopping Cost?